The perfect multi-tasking scope that works anywhere! YukonTM is lightweight, compact yet extremely powerful. A Newtonian refractor system allows this surprisingly small 9 in. 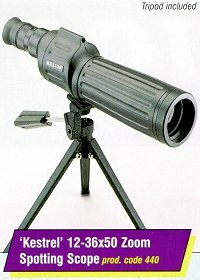 variable power 20-50x50 scope to be easily packed away for long hikes. Full-featured optics allows perfect image quality in all weather conditions. The YukonTM can be ordered as a package with our exclusive Tripod/Car window mount kit and deluxe padded Corduroy carrying case. Yukon's tripod helps provide the user with a steady image at high magnification viewing, in the car, at home or in the field. Yukon's patented 17" telescopic table tripod has been paired with our unique car window mount in offering the user an exceptional one of a kind mounting system. Field of View, ft/m @ 1000 yd. The Waterproof model of the scope can be used in any weather conditions and will continue to work normally after complete submersion in water. The Yukon 100X is a revolutionary new spotting scope with unique optical characteristics. This is the first spoting scope on the market thet will deliver crystal clear magnification from 6 Power to 100 Power with no distortion and no loss of image quality. This exclusive capability is achieved by using two multicoated objective lenses, one with 35 mm and the second with 100 mm aperture - both sharing a common ocular lens. The enormous light gathering capabilities of the 100 mm objective lens makes the picture clear and bright in most viewing conditons, even in twilight. For the low magnification observation or for general aiming, the 35 mm lens system with linear zooming is utilised. This function will bring objects from 6 times to 25 times closer to the observer. When more magnification is desired, the light path can be turned from one objective lens to the other by easy twist of a knob. The scope will then switch to the 100 mm objective lens sustem. In this mode, the linear zooming capabilities of the scope will provide high resolution images that are 25 times to 100 times closer to the observer. The Yukon 100X performs these achievements in a housing that is rugged, compact, light-weight and rubber armored. The Yukon 100X sportting scope is produced in 2 models - one with a straight ocular eyepiece and another with an offset eyepiece - the latter is especially useful for observations when the user can't align his/her viewing position with the scope - for example, when lying in prone shooting position. The offset eyepiece adjusts relative to the axis of the scope. It allows a user to be more comfortable in any position during observation. The Yukon 100X will accommodate tripods with threads of 1/4 ad 3/8 inches. The YukonTM brand of spotting scopes continues its expansion of high quality optical products with a new series of affordable spotting scopes. Incased in Yukon's original rubber armored body, the new ScoutTM offers the most popular power ranges at a surprisingly low cost. With plenty of power for a broad range of uses, the ScoutTM is as functional at home for viewing wildlife, as it is traveling, hiking, or prolonged use in nature observation. The ScoutTM series feature a large diameter (50 mm) front lens, which produces excellent light gathering and transmission properties. Enhanced with our special multi-layered Magnesium Fluoride coatings, Scout's all-glass optics provide a sharp and clear image even in low light conditions. Each ScoutTM is tripod mountable and can be purchased with our exclusive tripod/car window mount kit. Engineered to the highest standards featuring high quality fully coated precision ground lenses providing excellent image quality. This model has a wide variety of applications for the tourist, hunter, wildlife observer and astronomer alike.